28 MMS November 2017 mmsonline.com RAPID TRAVERSE Machining Technology in Brief machining center for turbine blade repair, thanks to GE's acquisition of Alstom Power in 2015. Hartmut Hähnle, formerly of Alstom and now senior engineer with GE Power Services' Global Repair organization, has been involved with this work on the application of additive manufactur- ing for turbine blade repair since the proof of concept was demonstrated by a U.K.-funded research project. Now, he describes how the application of metal 3D printing to existing turbine blades has proceeded even further under GE. At the GE Power Services manufacturing site in Birr, Switzerland, his team recently used the Hamuel machine to not just repair blades but also modify them for improved performance. The Hamuel machine realizes additive manu- facturing using the Ambit system from Texas- based Hybrid Manufacturing Technologies. An This turbine blade root form was improved after the blade had been in use for years. Originally, more space was left open in the slot than needed. Performance data showed the slot could be closed to increase efficiency. The combination of metal 3D printing and machining allowed for this change. The more shiny portion at the top of this "fir tree" shape is the new sealing feature that was added. Ambit head loads into the machine's spindle (using the same interface as a toolholder) to allow the machine to per form metal deposition via laser cladding. 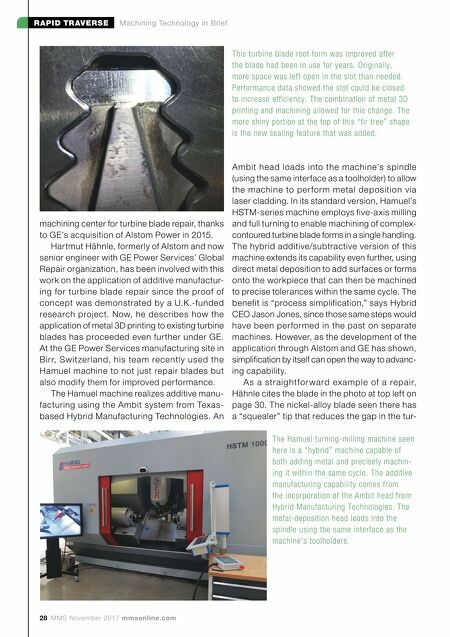 In its standard version, Hamuel's HSTM-series machine employs five-axis milling and full turning to enable machining of complex- contoured turbine blade forms in a single handling. 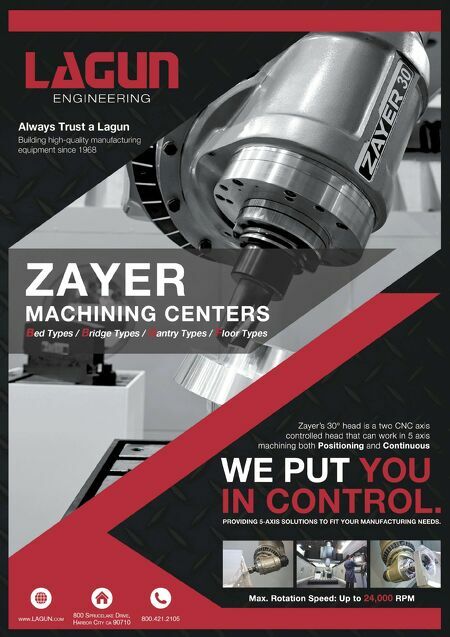 The hybrid additive/subtractive version of this machine extends its capability even further, using direct metal deposition to add surfaces or forms onto the workpiece that can then be machined to precise tolerances within the same cycle. The benefit is "process simplification," says Hybrid CEO Jason Jones, since those same steps would have been per formed in the past on separate machines. However, as the development of the application through Alstom and GE has shown, simplification by itself can open the way to advanc- ing capability. As a straight for ward example of a re pair, Hähnle cites the blade in the photo at top left on page 30. The nickel-alloy blade seen there has a "squealer" tip that reduces the gap in the tur- The Hamuel turning-milling machine seen here is a "hybrid" machine capable of both adding metal and precisely machin- ing it within the same cycle. The additive manufacturing capability comes from the incorporation of the Ambit head from Hybrid Manufacturing Technologies. The metal-deposition head loads into the spindle using the same interface as the machine's toolholders.